Our 3rd Annual hot wings round-up, the Week of Wings III, begins with a spectacular dry rub product, a Texas spice blend from Kramer’s Gourmet Foods. 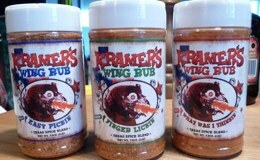 Kramer’s Wing Rub is available (from mild to hot) in Easy Pickin’, Finger Lickin’, and What Was I Thinkin’. When Lance Kramer contacted me about his wing rubs, I jumped at the chance to review them. 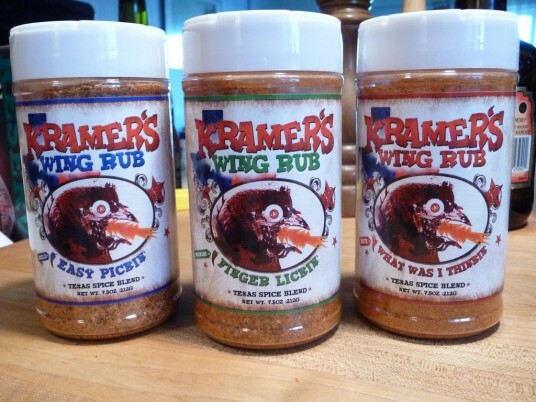 I love a good, savory, spicy dry rubbed wing, and Kramer’s ingredients looked awesome (the mild and hot feature Bhut Jolokia or Ghost Chile peppers), and his graphics and generous 7.5 ounce packaging were visually appealing.